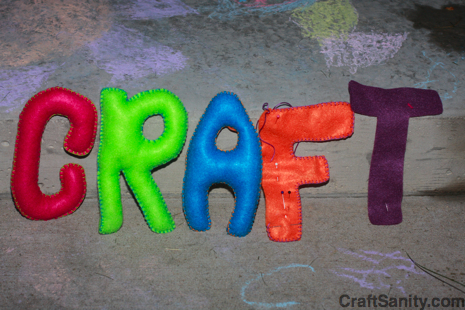 I’m working on a felt CraftSanity banner to decorate my “free” booth at the Fulton Street Artisans Market this Sunday in Grand Rapids. As you can see I have a bit of work to do. If you’re local, I hope you can stop by and say hello. I’ll be passing out goodies including free project instructions and CraftSanity buttons. I’ll also be running a drawing for T-shirts and other goodies. Most importantly, I will be actively looking for artists and crafters to write about. So if you’re a West Michigan maker (or you live somewhere else and own a private jet), please stop by and introduce yourself. I can’t wait to hear your story. If all goes well, I’ll be wearing a new apron and sitting under a completed, felt banner in booth 22. Check out Friday’s “Take Five” segment for a market preview. I’ll be showing off handmade goods from some of the 60-plus vendors who will be there Sunday. Watch live in Grand Rapids on TV 13 at 9 a.m. or check back here to see the clip later in the day. I have been exploring for a little for any high-quality articles or blog posts on this sort of area . Exploring in Yahoo I finally stumbled upon this web site. Studying this information So i am satisfied to show that I’ve an incredibly good uncanny feeling I discovered exactly what I needed. I such a lot certainly will make sure to do not forget this web site and provides it a glance regularly. Great – I should definitely pronounce, impressed with your web site. I had no trouble navigating through all the tabs and related info ended up being truly easy to do to access. I recently found what I hoped for before you know it in the least. Reasonably unusual. Is likely to appreciate it for those who add forums or anything, website theme . a tones way for your customer to communicate. Nice task..